The changing climate is going to affect a lot of things around us in the coming years, but perhaps nothing more than the most overlooked (quite literally) item in local government’s quiver of tools, the lowly road culvert. “Recent trends show that we are getting larger storms, the amount of rain we’re tending to see at one time goes up. . . . When there is larger flow, culverts tend to blow out more,” said Roy Schiff, a water resource engineer, summarizing why penny-pinching selectmen and road agents are taking more interest in culverts these days. Schiff, of Connecticut-based Milone and MacBroom, is coauthor of a new report that assessed 344 culverts in 11 towns that are part of the Piscataquog River watershed, which stretches from Henniker down to Lyndeborough and over to Goffstown. Culverts are the larval stage of bridges, allowing travel over running water that isn’t wide enough to require a true span. They’re usually metal pipes a few feet in diameter, with dirt piled around them and pavement on top of the dirt and tend to be so insignificant that we don’t even realize they’re there. Until floodwaters rip them out and close the road for a year, that is. That’s exactly the idea behind the Piscataquog River Watershed Culvert Prioritization Model (comes trippingly to the tongue, doesn’t it? 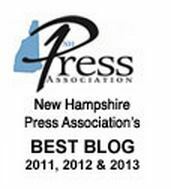 ), a creation of the New Hampshire Department of Transportation and Southern New Hampshire Planning Commission. The assessments are designed to help towns decide which culverts to tackle and when, which is not as straightforward as it sounds. Setting priorities requires knowing not just which culverts are most important for traffic flow, but which ones are most at risk, a function of the status of the ecosystem, of what’s happening upstream, and what’s likely to happen as “extreme weather events” (i.e., wicked heavy rains) become more common. A culvert sized to easily pass 800 cubic feet of water per second, a typical non-alarming but high amount for a central New Hampshire stream, is going to be so full if the flow gets to 3,000 or 4,000 cubic feet per second that it can be choked by floating trees and other debris, or just stirred up sediment. “Having a foot of sediment or two floating around in a storm is not uncommon,” Schiff said. A choked culvert backs up water, which can flow over the top, eroding the pavement, and eat away at the soil around the culvert, weakening it or even shoving it aside. Then there are the environmental issues. A culvert consisting of a metal pipe raised above the natural streambed acts like a dam, slowing the flow and keeping fish and other aquatic life moving upstream and downstream to thrive as water levels and water temperature change during the year. A stream with two or three such culverts – a very common scenario – has been chopped into a series of unrelated segments that struggles to support the sort of species we’d like to see, such as native trout. 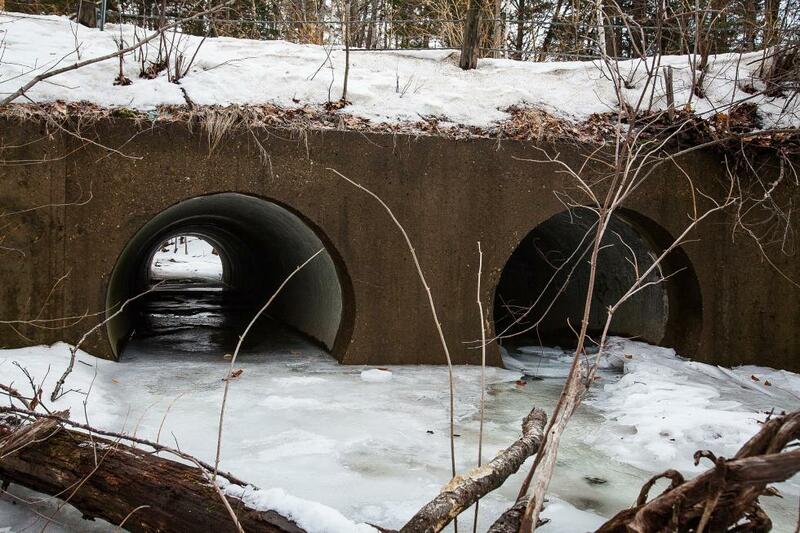 The state has guidelines for culverts to aid fish passage, urging them to be sized the full width of the channel for the streambed: ideally, rather than a circular pipe, they could be semi-circular, allowing a flat bottom the full diameter of the passage. Because they are bigger, such culverts also tend to be more resilient to flooding. “A Vermont study after (Hurricane) Irene – they had done a few big fish-passage culverts and those culverts made it through the big floods. . . . There’s a positive economic return even if you spend more up front,” Schiff said. In other words, it’s less expensive to build a culvert properly in the first place than to build it cheaply and then have to replace it while traffic is rerouted. And like it or not, we’re going to be facing this choice a lot more as abnormally heavy rain, alternating with dry spells, becomes the norm. It’s just another complication that climate change is bringing. For more information about the project, contact the Southern New Hampshire Planning Commission at 669-4664. A workshop is slated for Monday at 5:30 p.m. in the New Boston Public Library. Oops – typo. My last reference to 1938 should have been 1934. The floods of the 1930s reflect lingering effects of heavy deforestation. Spot on, David. You do not have to live on the Seacoast to be affected by climate change. Some of us have lived through at least two warming and cooling periods. So listening to this vacant-minded regurgitation of unproven hypotheses in pursuit of an as-yet-to-be-defined ideal unchanging climate, is somewhat amusing…but very scary. WHY? because the worrywarts have taken over the asylum.